There's a scene in this film where young Nigel Slater, (played with wonderful pathos by a young actor named Oscar Kennedy) is in his room under the covers moaning and breathing heavily, his father hearing the suspicious sounds, barges in to stop what we all assume is a prepubescent self-exploration. Turns out Nigel is pleasuring himself, but not with his hands, rather with his eyes. He's actually devouring a food magazine, with a flash light, under the covers. The sights of beautifully prepared dishes and desserts is what has him so excited. There's nothing quite like cheese on toast – and the endless variations make for truly sumptuous snacks. ...the arrival of ‘Miss Potter’ – a coarse but beguiling cleaner on the make, who bewitched Slater Sr with her saucy outfits and seductive home cooking. Dressed in crimplene housecoats and seamed stockings, a cigarette permanently dangling from her rouged lips, Miss Potter, becomes the second Mrs Slater, leaving a desolate Nigel out in the cold -By Elizabeth Sanderson and Christine Challand. (This article featured Nigel's real-life stepsister, not mentioned in the film, who is livid over the making of Toast both the book and the movie, as she feels it's a libelous depiction of her mother and her mother's marriage to Nigel's father). But on a lighter note, who would think housework could be so suggestive? There is a very clever montage underscored by the song "The Look of Love", where Nigel's father can't take his eyes off of Mrs. Potter's ample behind, as she scrubs and polishes, then gets turned on when she runs the vacuum cleaner in and out between his legs. As far as Nigel is concerned the only good thing about Mrs. Potter is the fact that she can cook. And cook she does, the film treats us to another montage, this time of fattening, artery clogging, caloric dishes popular in the late 60's early 70's. But as Nigel discovers his own talent for the culinary arts, Mrs Potter feels her place in the family is being threatened and a rivalry develops between Nigel and his step-mum, causing anguish for Nigel's father. While watching the film, I felt the tone was reminiscent of Billy Elliot, and soon discovered the reason being, it was penned by the same screenwriter, Lee Hall. 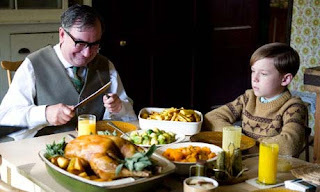 I liked the movie, not just because it represents food in film; but rather because of its subtle humor mixed with melancholy; the nice handling of Slater's sexual orientation; there's some gems of wisdom by Nigel's precocious boyhood friend, and yes, plenty of feasting for the eyes. I contacted Katherine Tidy, the film's food stylist for an online interview earlier this week. She has yet to respond, but check back, as this post may be expanded to include her insights.